The weather is heating up here in Southeast Alaska, and so is the Halibut fishing. Some of the favorite adventure opportunities here at Alaska’s Boardwalk Lodge are our saltwater fishing trips. Although freshwater adventures remain a favorite of many outdoorsman here, Alaska Halibut fishing shouldn’t be missed. Recent changes in regulation mean that not all fishing lodges and charter boats in Southeast Alaska are permitted to offer guided Halibut fishing. Boardwalk Lodge is one of the few sport lodges where you can enjoy the chance to catch one of these monsters. What is the Pacific Halibut? Pacific Halibut is a large, flat fish that has been known to grow to incredible sizes here in Alaska. With a life span that can reach 55 years and sizes that easily hit the 100-pound and higher range, this fish is the kind of trophy catch that leaves anglers with an unforgettable experience. The average Alaskan Halibut weighs between 20 and 40 pounds, but Alaska’s Halibut sport fishing record currently stands at a whopping 459 pounds. They tend to linger around reefs and the rough crags of the Inside Passage. Our knowledgeable U.S. Coat Guard Certified fishing guides are skilled at navigating both the deep and shallow waters where they feed. One common method for catching Alaska Halibut is bait fishing. Jigging is another favorite method, as it gives you more of a chance to actively fish and lure out the most aggressive Halibut from their depths. Catching Halibut isn’t an experience you can get just anywhere. 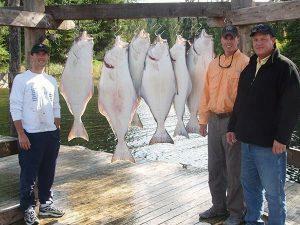 The summer months in Alaska remain the most ideal for Halibut fishing. Prince of Wales Island, with its rocky straits and unique combination of deep and shallow waters, provides prime Halibut habitat. Whether you come to Alaska for freshwater fishing or saltwater angling, we encourage you to fish for Halibut. Hooking one of these incredible fish will likely give you a huge fight — you’re likely to get hooked yourself!